They're not what you expect.They're funnier. You're still reading this? Go check out the books! li·tur·gi·cal mys·te·ry lə-'tər-ji-kəl mist(ə)rē, n.
Any one of a series of absurd novels featuring choir director/detective Hayden Konig. Why do people keep dying in the little town of St. Germaine, North Carolina? It's hard to say. Maybe there's something in the water. Whatever the reason, it certainly has nothing to do with St. Barnabas Episcopal Church! 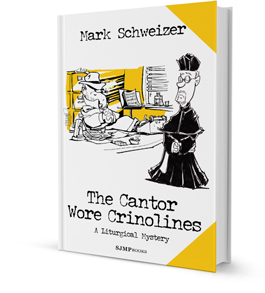 [These] liturgical detective mysteries have taken me to that place where I can't breath, my words make no sense, and tears roll down my cheeks because I'm laughing so hard. It's been a long time since we've had so much fun reading a mystery. It's like Mitford meets Jurrasic Park, only without the wisteria and the dinosaurs. The icing on the cake is the humor. Included almost as asides or fillers, the hilarious happenings around St. Germaine are told with such a droll delivery, they kept me howling with unrestrained glee. Do not try to drink or eat while reading this book. It was a dark and stormy night: the wind whistled like an old man with drugstore teeth trying to teach his grandkids to say, “She sells sea shells by the sea shore,” causing the little shavers to wonder why Peepaw was suddenly talking like Daffy Duck, whether he’d just had a stroke, and if any one of them was in the will. So begins Police Chief Hayden Konig's final opus. 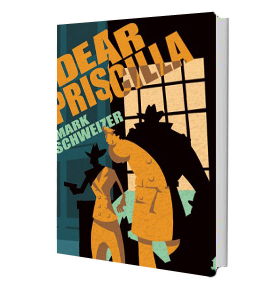 His writing skills have not improved (despite using Raymond Chandler's typewriter to bang out his hard-boiled prose), but his crime solving prowess is still first rate. He'll need it, since murder seems to abound in the little Appalachian town of St. Germaine, North Carolina. St. Germaine is in a season of change: a couple of new shops have appeared on the square; the Great Smoky Mountain Renaissance Festival has just opened out at Camp Possumtickle; and St. Barnabas Church has a new priest, straight from France. The adventure begins! Between the new priest, church politics, and the annual holiday feud between the Rotarians and the Kiwanians, you'd think that Hayden had enough to worry about. Still, nothing says "Christmas" like a dead body in the choir loft. It's a good thing that Hayden keeps a loaded Glock under the organ bench. As the season of Lent begins, there’s an interim priest at St. Barnabas – a priest with a wife, and she has an agenda. If the “Edible Last Supper” (featuring the Mary Magdalene Coffee Bar), wasn’t enough, Hayden also has to deal with a Clown Eucharist, snakes loose in the church, the Feng Shui Altar Guild, and a dwarf verger named Wenceslas. Until a body is found inside the altar of St. Barnabas, the biggest crime that Hayden has had to deal with lately is the theft of a cinnamon bun that looks like the Virgin Mary. But, as All Saints Day approaches, the bodies pile up and it's time to get serious. Easter is right around the corner and nothing says "He is risen!" like a Pirate Eucharist. 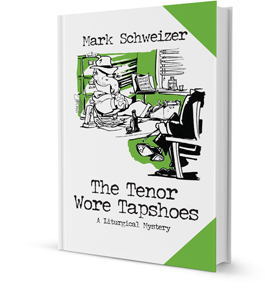 Suddenly, a shot rang out, a woman screamed, and Detective Konig has another dead body in the choir loft. It's business as usual in St. Germaine. Where does a 500 lb. "born-again" gorilla sleep? Anywhere he wants! Summers in North Carolina are usually peaceful, but when Kokomo, the world-famous "signing" gorilla, comes to town, a dead body turns up and all the evidence points to the great ape. Can Hayden solve the mystery in time to save Kokomo? Autumn in St. Germaine, North Carolina, is an enchanting time of year. 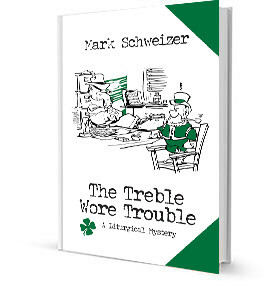 But throw in two murders, an election, a Christian nudist camp, and St. Barnabas' answer to the local Baptist church's annual Singing Christmas Tree — the first-ever performance of The Living Gobbler — and things are bound to become complicated. St. Barnabas Day is reason for celebration! 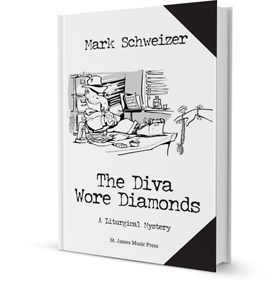 The church is playing host to parishioners and dignitaries alike, but when a time-capsule from 1900 is opened during the festivities, the discovery throws the whole town into a tither. 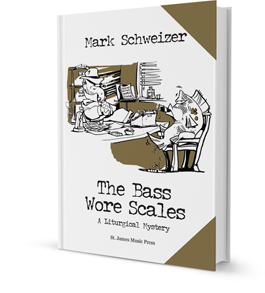 What do the bones of an ancient king, a scoodle of skunks, the best Christmas parade ever, and an obnoxious deacon have to do with the dead body floating in the lake? Maybe nothing. Maybe everything. It's up to Hayden to pull all the clues together like two cousins in a Kentucky hayloft. After all, Epiphany is right around the corner! Vicar Fearghus McTavish is a Calvinist Anglican priest with strict Scottish Presbyterian leanings—not exactly the perfect interim priest for St. Barnabas. So when the church participates in the town Halloween carnival, it's only a matter of time before something goes terribly wrong. Hayden Konig, and all the usual suspects, return in this heartwarming Christmas tale. 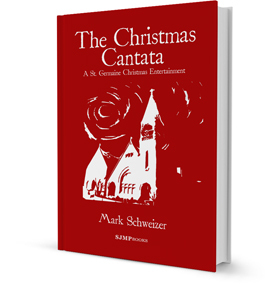 When a long-lost cantata is found in the basement of the courthouse, a Christmas Eve performance is the order of the day. What happens next is anyone's guess. Not a murder mystery, but one of the sweetest stories you're likely to read. With the season of Lent just around the corner, it seems the perfect time for the new priest to put her own stamp on the worship style of St. Barnabas. With a dead body and a kidnapping to sort out, Hayden doesn't have much time to worry about the Reverend Rosemary Pepperpot-Cohosh. Maybe he should. Groundhog Day isn't usually a liturgical holiday, but when the new priest decides that a Candlemas Evensong on February 2nd is in order, what can the choir do but comply? 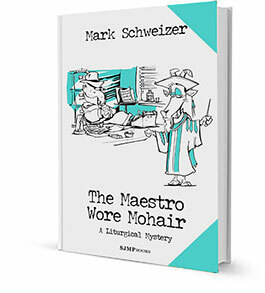 As "St. Groundelmas" approaches, three dead bodies turn up, and the clues point to a trashy murder mystery being read by the Blue Hill Bookworms. Autumn is drawing nigh, and when a skeleton turns up in the woods, it’s all anyone is talking about. That is, until the Maestro and her minions come to town. Now there’s another dead body, a thirty-year-old murder mystery, and all the usual suspects. Can Hayden figure it all out before another victim is found? Fat Tuesday: It’s only natural that St. Barnabas Church should offer a Lenten class called "Paunches Pilates." As the gang ponders forty days of penitence and self control, it becomes clear that there is a murderer in town. Ashes to ashes, dust to dust — will they ever get this mess cleaned up? St. Germaine is in a season of change: a couple of new shops have appeared on the square; the Great Smoky Mountain Renaissance Festival has just opened out at Camp Possumtickle; and St. Barnabas Church has a new priest, straight from France. What could possibly go wrong? 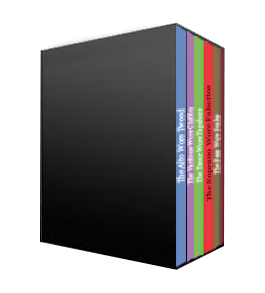 The first five Liturgical Mysteries and the Christmas Cantata in an autographed boxed set. And, at a great price! Are youLooking to save paper? 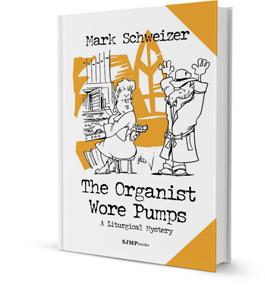 Most of the St. Germaine Liturgical Mysteries are available for your Kindle or Nook. 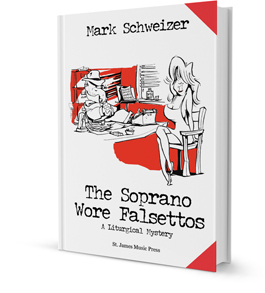 In 1974, Mark Schweizer, a brand-new high-school graduate decided to eschew the family architectural business and become an opera singer. Against all prevailing wisdom and despite jokes from his peers such as "What does the music major say after his first job interview?" (answer: You want fries with that? ), he enrolled in the Music School at Stetson University. To his father, the rationale was obvious. No math requirement. Everything happens for a reason, however, and he now lives and works as a musician, composer, author and publisher in Tryon, North Carolina with his lovely wife, Donis. If anyone finds out what he's up to, he'll have to go back to work at Mr. Steak. He actually has a bunch of degrees, including a Doctor of Musical Arts from the University of Arizona. I know! What were they thinking? 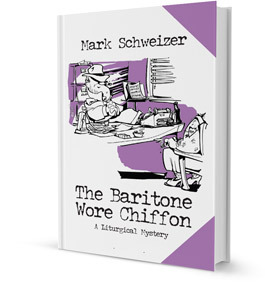 In the field of bad writing, Mark had the distinction of receiving a Dishonorable Mention in the 2006 BULWER-LYTTON FICTION CONTEST, an annual contest in which the entrants compete for the dubious honor of having composed the worst opening sentence to an imaginary novel. 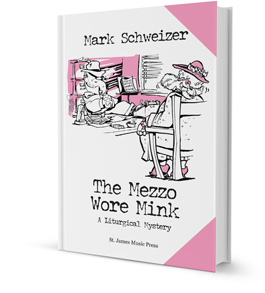 In 2007, his sentence now found on page 17 of The Mezzo Wore Mink was runner-up in the Detective Category. 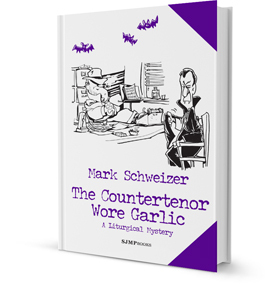 This, and two other of his entries, were featured in It Was A Dark and Stormy Night: A Collection of the Worst Fiction Ever Written, edited by Scott Rice and published by The Friday Project. 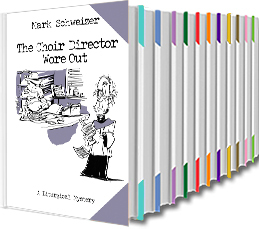 In varying stages of his career, Mark has waited tables, written articles for Collegehumor.com, won opera competitions, sung oratorios, taught in college music departments, raised pot-bellied pigs and hedgehogs, directed church choirs, sung the bass solo to Beethoven's 9th with the Atlanta Symphony, hosted a classical music radio show, taught in a seminary, sung recitals, started a regional opera company, published choral music, built a log cabin, written opera librettos, directed stage productions, helped his wife to raise their two children and managed to remain married for thirty-seven years. He also owns several chainsaws. Well, Donis says, it's never boring. 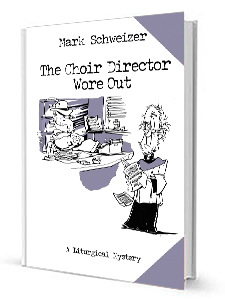 In the fall of 2001, I began what I hoped would be a funny little book about an Episcopal choir director/ detective that had a flair for bad writing. 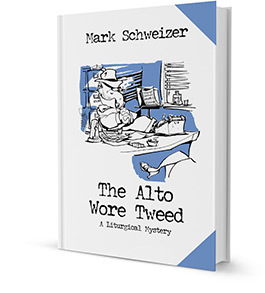 Now, fourteen years later, that book, The Alto Wore Tweed, is still getting laughs and the rest of the books (bad writing aside) are winning awards and working hard to catch up. 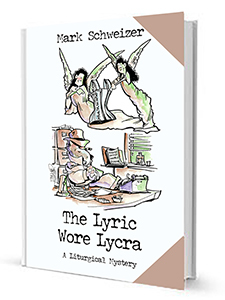 Thanks to you, the Hayden Konig adventures continue to make their way into the hands of mystery lovers and across church choirs, one reader and singer at a time. If you've enjoyed the mysteries in this series--please drop me a line. I'd love to hear from you. Or better yet, sign up for the SJMP mailing list. Perform these at your own risk! Listen to The Pirate Gloria. The ONLY anthem on the Dietary Laws of Leviticus.